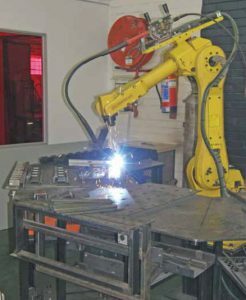 The use of welding robots is often limited to large production runs of identical items, not so much because of the cost of the robot or the programming effort, but because of the need for a suitably accurate jig for each new part. Altus Mostert of Robotic Innovations takes African Fusion on a visit to AlClad Interior Systems, a specialist manufacturer of shop fittings and retail interiors, to see how the Demmeler jigging system is being used to enable small numbers of customised parts to be robot welded. The Fanuc Roboweld 120 iB coupled to a Lincoln 455 power source making parts at AlClad’s Steeldale facility in Johannesburg. Traditional jigs are made and used to weld parts on five worktables in front of the robot. As a result of ongoing investment in technology and skills, AlClad is capable of providing quality products in any material. The main 8 500 m² manufacturing operation is based in Steeldale, Johannesburg, with a further facility in Durban and warehousing facilities in Cape Town and Port Elizabeth. “We have invested over R10-million in these facilities in the past two years alone. Our latest development is a fully automated polyurethane paint line that gives a quality of finish not previously available to the African market,” says Willing. A Demmeler jig for a trailer frame developed using Demmeler CAD. 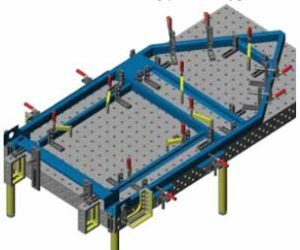 Every attachment available from Demmeler is represented accurately in the CAD model. The metal components needed for furniture and shop fittings is also all designed and manufactured in AlClad’s facilities and most of the welding is done at two robot stations. The older station consists of Fanuc Roboweld 120 iB coupled to a Lincoln 455 power source. This robot is surrounded by a semicircle of five worktables supporting traditional hand-built jigs. The new robot system – a Fanuc Arc Mate 120 iC with a Lincoln 400i power source – represents a move by AlClad towards a more flexible approach to jigging. “The idea is to move away from making permanent jigs for each individual design and towards more flexible jigging solutions,” says Willing. The new robot has only two workstations for parts, a rotator between a head and a tailstock 2,0 m apart and a Demmeler 1,5 m by 1,0 m 3D work and welding table system. “This solution allows us to very quickly produce results from our designs,” says Willing. “We are currently concentrating on the small parts, but Demmeler tables can be extended and we intend to take advantage of that,” he adds. The Demmeler jigging table along with all the associated attachments, allows for very quick assembly of jigs. “It’s like a Mechanno set,” adds Mostert. The parts are designed to fit together very easily and to be used and reused in a variety of different ways. Demmeler jig for tractor cabin. Mostert describes how jigs are designed: “Demmeler systems come with their own CAD software for jig design. Any 3D solid model of a part can be imported and then dropped onto the virtual Demmeler table. Then the standard parts for jigging and clamping are all available and they can be easily laid out around the part to design a jig. Every attachment available from Demmeler is represented accurately in the CAD model,” he claims. Attachments are mounted to the table through precisely drilled and spaced holes. A ring of ball bearings is pushed out when a knurled nut on top is turned. These lock the clamps, end-stops and a wide variety of support and locating attachments firmly to the chosen hole. “The system is ideal for companies like AlClad, who get orders for say 100 parts. Previously, in order to make these, you would need to tack together a make-shift jig, which may not be accurate enough for the robot. The alternative is to have a jig properly manufactured and machined – at the risk of putting the jigging costs higher than the total contract costs. With a Demmeler system, a request for 10 parts can easily be accommodated. You take the CAD model of the part to the drawing office, who design a jig layout offline while the robot is still busy with other parts. 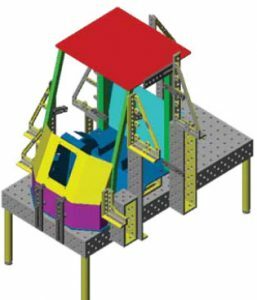 Once designed, the layout can be sent to the robot where it can be very quickly assembled. The robot program can also be written offline in a virtual environment called Roboguide. Then, in the future, if you get repeat orders, the programme and the jig layout are immediately available at no additional cost, enabling huge savings on repeat orders,” explains Mostert. 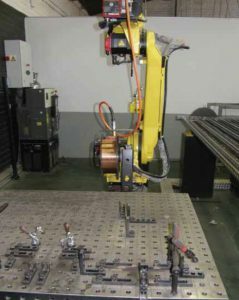 The new welding robot system – a Fanuc Arc Mate 120 iC with a Lincoln 400i power source – has only two workstations for parts, a rotator and a Demmeler 1,5 by 1,0 m 3D welding table and jigging system. Robotic Innovations has also added a further local innovation to the system, a coded plug to automatically link a jig layout to a robot welding program. “Every time you design and make a jig and write a robot welding program, you give that combination a binary coded number. Then you download this code to a plug that fits onto the Demmeler jig. If you then have repeat orders for a part that has already been programmed, you build the jig with the binary plug and the moment you press the green button on the robot, the system automatically recognises the code and downloads and runs the correct robot welding program for that part,” he explains.